"We have to put technology in its place," said MIT sociology professor Sherry Turkle when she appeared on The Colbert Report recently. The message: Technology is consuming us. Turkle takes issue with the constant texting, Tweeting, and Facebooking that happens at the dinner table by both children and adults. She believes we have yet to fully understand the ramifications of our relationship with the digital. This state of constant connection is degrading our ability to communicate with each other—the quality of our conversations is declining. We ask simpler questions and we get simpler answers thanks to the ease of texting. And we haven't fully understood the impact of all that we share. We need privacy, she argued. "What is intimacy without privacy? What is democracy without privacy?" Can we truly have these things without privacy? Turkle painted a bleak picture for the release of her book, Alone Together, to which Colbert responded that he respected the amount of work she had put into her research, but her message might be more effective if she could distill it to 140-characters. I think that he actually hit the nail on the head with that remark. I'm actually a huge fan of Turkle's work. Her other books The Second Self and Life on the Screen were instrumental to me when I started my forays into digital sociality. But this interview represented a definite break from her normal stance on technology—although admittedly, hints of this were evident during her panel at the Paley Center last year. I want to be clear that Turkle has continued to express support for our technological inclinations. However, she thinks that we may be taking it a bit far. While I agree that it's easy for us to get swept away in a sea of digital communication, I think that perhaps we're overlooking the ways in which we can adapt to these circumstances and the ways in which these types of media have actually brought us together. Ed Note: Bear with me Readers, as I plumb the archives from The Urban Ethnographer to bring you a personal favorite of mine. Happy Monday! 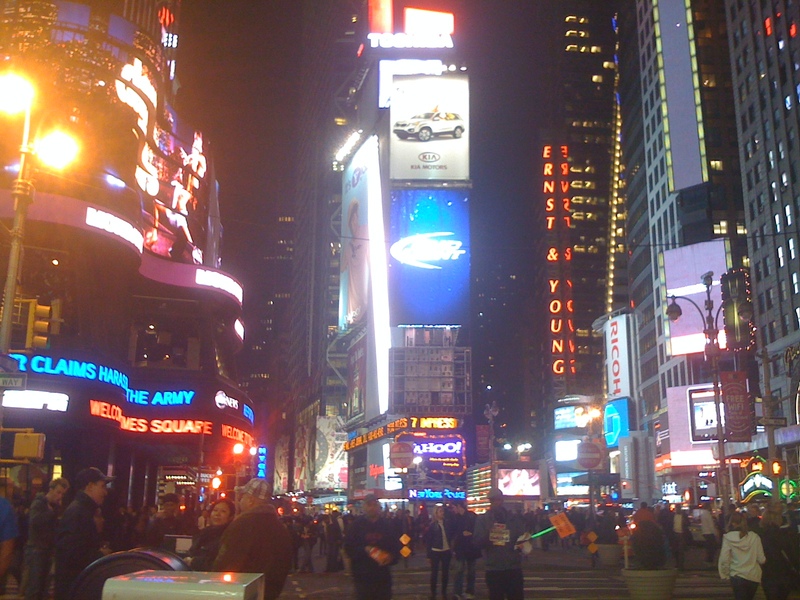 A late summer night in Times Square (Sept. 2010). As the sun sinks over the Hudson River, New York City doesn’t power down. Lights flicker on and soon the famous skyline is lit in a blaze that defies the natural clock. But few stop to consider where and how that electricity comes from and what it means when it isn’t there. That is such a frightening consideration that we prefer to pretend it isn’t a possibility. New York City owes a debt of thanks to Thomas Edison for the brilliance that the skyline projects at night. He is the reason that we have the power to be the city that never sleeps. And it’s not because he invented the light bulb—he didn’t. Rather, it is because Edison gave us the grid that serves as the basis for powering the city, even today. He saw the big picture. But when was the last time we really considered the grid’s potential to support our growing needs? Are we capable of seeing the big picture now? There's a lot to report on since our last Anthro Reader. I'm still trying to get myself sorted out from ScienceOnline, but I can see the beginnings of my old routine taking shape so hopefully things will be back to normal soon. Incidentally, if you're interested in learning a bit more about the conference, you can find a fairly comprehensive list of media responses here. That is, does this piece represent simply a simmering (perhaps interpersonal) issue in the (bio)archaeology of Tuscany? Or are Mallegni and Zecchini capitalizing on the worldwide news coverage of Pompeii to shed light on other caches of archaeological material that need better funding and better oversight? What is their eventual goal in writing this, and whom do they need to convince? Kristina also shares an update from one of the archaeologists trying to raise the public consciousness. This will definitely be an interesting story to follow. One way to answer these questions is to zoom out, to look at the music and not the neuron. While music can often seem (at least to the outsider) like a labyrinth of intricate patterns – it’s art at its most mathematical – it turns out that the most important part of every song or symphony is when the patterns break down, when the sound becomes unpredictable. If the music is too obvious, it is annoyingly boring, like an alarm clock. (Numerous studies, after all, have demonstrated that dopamine neurons quickly adapt to predictable rewards. If we know what’s going to happen next, then we don’t get excited.) This is why composers introduce the tonic note in the beginning of the song and then studiously avoid it until the end. The longer we are denied the pattern we expect, the greater the emotional release when the pattern returns, safe and sound. That is when we get the chills. One of my first research projects investigated the connection between mood and academic performance, and I used music as a mood mediator. I'm always interested in reading more about the ways music can influence our mental state. a superstreet is a surface street (not a highway) where the left-hand turns from side streets are re-routed, as is traffic from side streets that needs to cross the thoroughfare (see the diagram at the top of this post). In both instances, drivers are first required to make a right turn and then make a U-turn around a broad median. While this may seem time-consuming, the study shows that it actually results in a significant time savings since drivers are not stuck waiting to make left-hand turns or for traffic from cross-streets to go across the thoroughfare. If anyone lives near a superstreet, let us know how it's been working for local traffic patterns. And finally, I'm sort of jealous that Ephemeral New York has some awesome shots up of the old City Hall subway station. The New York Transit Museum occasionally takes tours down into the tunnel—which unfortunately I seemed to have missed. Thanks for sharing these! The Bowery Boys also has an interesting special explaining the names of New York City bridges that will surely make for some entertaining morning reading. The Emotional Depth of a Turnip—Do Men and Women Read Emotions Differently? She was clearly upset. The disgust on her face was apparent. As was her frustration when she shook her head at the man standing numbly beside her and said, "You have the emotional depth of a turnip!" The rest of us in the subway car did our best to look busy—headphones were put on, games were played on cell phones, even the morning newspaper made a few reappearances though it was the evening rush hour. I have to admit that I was somewhat amused by the situation because I'd recently directed this phrase at a male friend myself, albeit in a less charged environment. The subway man's response was interesting: He appeared bewildered. And the response was eerily similar to that of the recipient of my own statement (though in fairness he accepted my diagnosis with some grace). Admittedly, I don't know the cause of this couple's argument, and I certainly don't know anything about their personalities or the nature of their relationship. Still the perceived shared response made me pause. I don't mean to imply that all men lack complex emotional responses—emotions and relationships are difficult to analyze and label in broad, social terms. Appropriate social and emotional responses are often culturally driven, and produced to various degrees dependent on personality. Nonetheless, regardless of cultural association, some people, both male and female, seem more emotionally expressive and perceptive when compared to others—is there a biological explanation for this? Possibly. But not in the way you would think. Lori Kobelan of Masters in Teaching has listed Anthropology in Practice at No. 7 in her roundup of the top fifty anthropology blogs. It isn't clear how the blogs were ranked, so I think the numbering may be an arbitrary listing. But as always, I'm glad to see that AiP is reaching such a broad audience. I'm in transit this week, but I've just got enough time (and battery power) to share with you some recent findings from Pew Internet. Normal posting should resume next week. At a time when content providers and users are weighing the advantages and challenges of paid online subscriptions, the Pew Internet and American Life Project has released data suggesting that users are willing to pay for online services and products classified as "intangible"—such as software, articles, and music. Penn Station is my portal into and out of New York City. I've estimated that I spend at least 250 hours a year there. Most days, I pass through like other travelers intent on reaching a destination but it's hard for me to completely ignore the history behind the basement cavern that occupies this space. Once a beautiful Beaux-Arts building, it was torn down when Pennsylvania Railroad went bust to make room for Madison Square Garden. 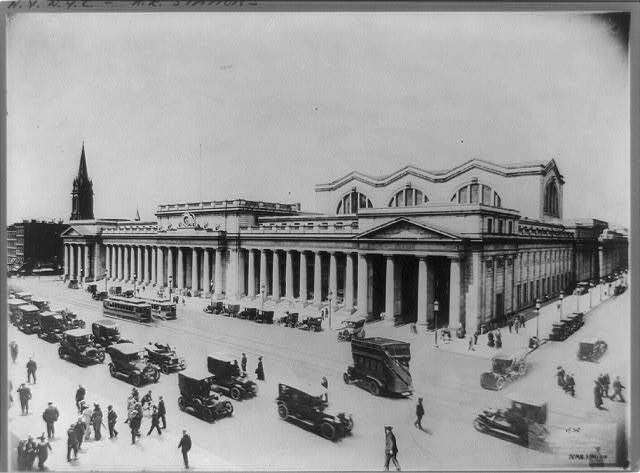 But traces of the old Penn Station remain—if you know where to look. I've had this Glenn Collins 2003 NYT article in my possession for about a year—since writing my original Penn Station post, which was inspired by some artwork meant to connect the newer facility to its past. Written on the 40th anniversary of the demolition, the article cites John Turkeli, a railroad historian and urban archaeologist, and walks readers through the remaining markers of the original building. Every couple of months, I'd reread it and consider going on a historical scavenger hunt. But the truth is that my original post had really disheartened me, and I was sure that these remnants would have also been lost to progress. But one night while standing in front of Madison Square Garden, I looked up to find myself facing one of Penn Station's eagles. I was back within a week to follow the clues from Collins. You're invited to take a look at the places he guided me to. Ed Note: This post originally appeared on The Urban Ethnographer, where it was selected as a ResearchBlogging Editor's Selection. It has been slightly edited for posting here. I'm proud to announce that it was chosen for publication in The Open Lab competition. I'm delighted to be included in the company of such talented and critical writers. Many thanks to Jason Goldman who led the editorial team for this volume. I helped review some of the posts (though none of my own), so I have a deep appreciation for how difficult a job this was—the entries were amazing! The end result is a wonderfully diverse representation of science in 2010. It's been a very hot summer here in New York City. And the city smells. It's more than the smell of baking asphalt, exhaust fumes, and lack of deodorant—these smells are around all year. The heat has awakened older smells. Around midday, if you happen to stroll down by the South Street Seaport you can pick up on the smell of fish in the air. If you can manage to follow your nose—which really isn't all that hard to do—it will lead you right to the old site of the Fulton Fish Market. It has been closed since 2005, but if you close your eyes while you stand outside the gates of the old market building you can smell the day's catch and just hear the bustle of fishmongers at their trade. The list of finalists was released today—and I made the cut! The post selected is one from The Urban Ethnographer: Smells from the Past: The Fulton Fish Market, which I will repost here on AiP later today. I am honored and excited to be counted in the same space as Eric Michael Johnson, Hannah Waters, Brian Switek, Dr. Sky Skull ... and well, the list goes on! Special thanks is due to Jason Goldman, who worked tirelessly to put this edition together. There were over 900 entries, and Jason was charged with whittling that number down to 50 using a team of volunteer editors. This is a formidable representation of the science blogosphere, and I am absolutely thrilled to be a part of it. You can view all the finalists, and the editors, here. The latest edition of the anthropology blog carnival is live at Afarensis. The hominin has compiled an interesting collection of science writing from around the web, including a look at how silverfishes closed a museum, the nature of anthropology and publicity, Viking recipes, and the ethics of habituating primates. It's back to work now that the holiday season is over, which means getting reacquainted with my desk, both at home and at work. But desk time carries with it the increased risk of cardiovascular disease—it's no secret, after all, that physical activity is important, and desk time tends to be rather sedentary. 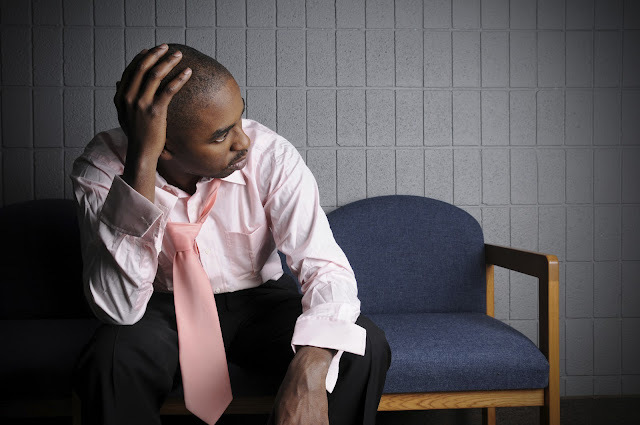 Travis Saunders' SciAm guest feature discusses offsetting the effects of sedentary behavior. The bottom line is that any exercise is better than none, and as we are a largely sedentary society, every little bit you can do counts. So taking small breaks throughout the day—actually walking away from your desk for a few minutes a few times a day—can add up, and help you meet current physical activity guidelines. At any given time there are "at least ten billion birds in North America ... and there could be as much as 20 billion—and almost half die each year due to natural causes," said ornithologist Greg Butcher, director of bird conservation for the National Audubon Society in Washington, D.C. It appears that the birds may have been stirred from their roost by firecrackers, and then died after flying into various objects. Biologists are saying that mass deaths are common, but are hoping to use the attention to bolster public awareness about other issues. That's it for this week. I'll be traveling next week, so the Anthro Reader will resume on Friday, January 21. I have a new character to add to the catalog of people who ride the subway: the Rubber. I boarded the No. 3 subway this morning along with a few other people, including a man about my age in a business suit. I was able to get an end seat near the door next to an older man. The man who boarded with me stood in the doorway. My seatmate got off two stops later, and his seat was taken by the Door Dweller whose leg brushed mine as he sat down. No big deal—we're in close quarters and we're bound to bump into each other. He murmured an apology and I gave him a quick nod. He shifted around a bit as he got his iPhone out and put in his earbuds, jostling me. And again, no big deal, this stuff happens. But as he settled into his seat his thigh pressed against mine, though there was ample room for us to sit without touching each other at all. Then he rubbed his leg against mine. I bristled, and expanded a bit—I've mentioned before that as a smaller person, I tend to get squashed on the subway sometimes by larger individuals. And then it happened again. Before it could happen a third time, in a very natural "I'm getting my phone out of my pocket" motion, my elbow connected with his rib cage. Hard. I apologized. He moved over. And winked at me. I got off two stops later. Sexual harassment on the subway is not a new thing. And for all intents and purposes, this encounter was relatively mild. I've had men press into me while standing up—generally, a well placed heel sends a clear message that they need to back off in those cases. And there are also more severe cases of exposure and masturbation. I'm also not afraid to get loud if I need to, and I'm glad to say that it seems more women are willing to speak up as well. Do you have public transportation survival skills to share with AiP readers? Let us know below. Remy, the aspiring culinary rodent. I have a secret: One of my favorite movies is about a rat who can cook—Disney/Pixar's Ratatouille. (Admittedly this isn't Wikileaks caliber information, but it's not exactly news that I share with people either.) It's the story of a rat who loves French food, and dreams of cooking for the best restaurant in France. The idea of a rat handling food preparation isn't the most appetizing image, and Remy (the culinary rodent) faces an uphill battle. The idea is so outside the norm of acceptable food practices—imagine a rat preparing your dinner!—that I feel strangely about my affection for these characters, but I can't help it. Their love for food makes me think of the connection we have with certain dishes, and the ways in which flavors can help shape our identity and remind us of our histories.